4125 SPE PARAGUAY (1943) Hands*. Map of the Americas*. Flags*. Scott No C148. Yvert No PA139. Specimen from the archives of the printer Waterlow & Sons. Pair with control punches. Interesting variety: imperforate vertically. **. 17043 SPE PARAGUAY (1962) Baden-Powell*. Set of 2 S/S, perf + imperf overprinted MUESTRA (specimen). Scott No 645a. 2336 SPE PARAGUAY (1964) Rocket*. Flags*. 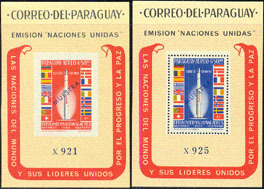 S/S perforate and imperforate (in different colors) with MUESTRA overprint. Scott No 835a, Yvert No PA390. 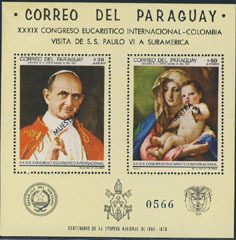 2089 SPE PARAGUAY (1965) Pope Paul VI*. Early Bird Satellite*. U Thant*. Lyndon Johnson*. Unisphere*. A. Fanfani*. Set of 8 imperforates in unissued colors overprinted MUESTRA. Scott Nos 903-10, Yvert Nos 818-22,PA417-9. 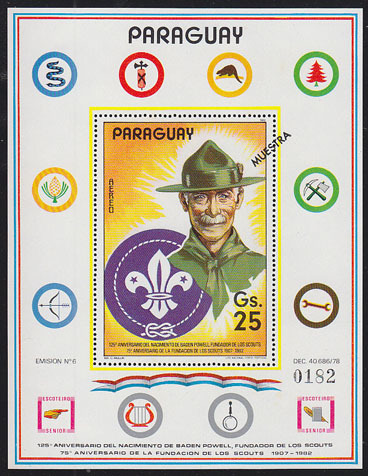 2265 SPE PARAGUAY (1965) Scout*. MUESTRA (specimen) overprint. Argentina Jamboree 1961. Scott No 850, Yvert No 785. 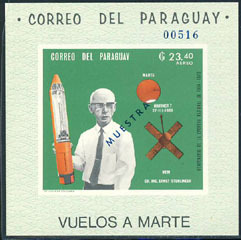 2338 SPE PARAGUAY (1965) Earlybird Satellite*. UN emblem*. S/S perforate and imperforate (in different colors) with MUESTRA overprint. Visit of Pope Paul VI to the UN. Scott No 910a, Yvert No PA419. 1562 SPE PARAGUAY (1966) J.F. Kennedy*. Satellites*. Set of 8 imperforates in unissued colors overprinted MUESTRA. Scott Nos 994-1001. 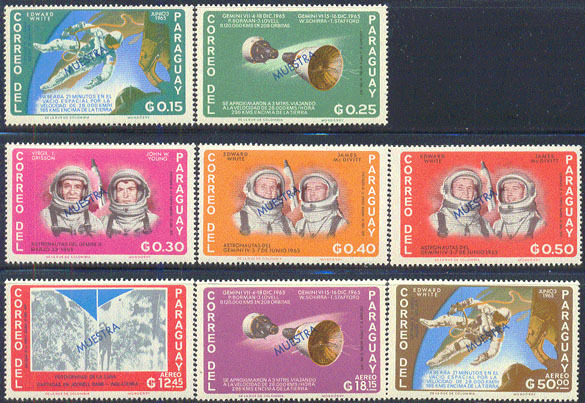 2339 SPE PARAGUAY (1966) Astronauts*. Space exploration*. 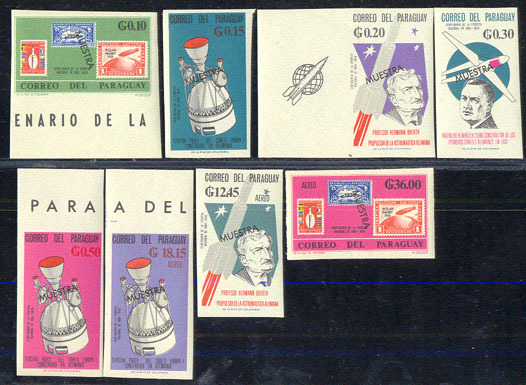 Set of 8 overprinted MUESTRA. Scott Nos 911-8, Yvert Nos 827-31,PA424-6. 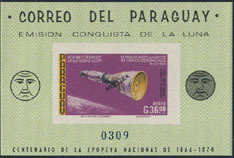 2340 SPE PARAGUAY (1966) Rockets*. Satellites*. Stamps*. 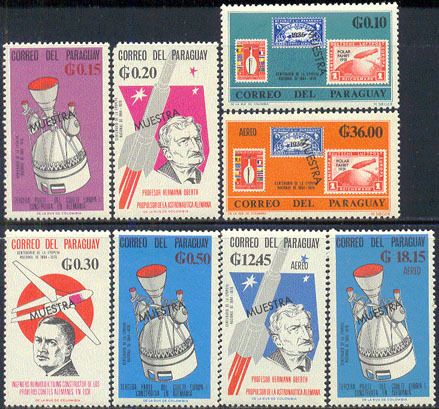 Set of 8 overprinted MUESTRA. Scott Nos 943-50, Yvert Nos 842-6,PA433-5. 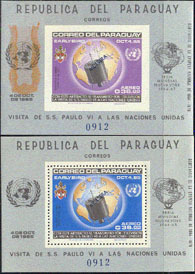 2341 SPE PARAGUAY (1966) Rockets*. Satellites*. Stamps*. 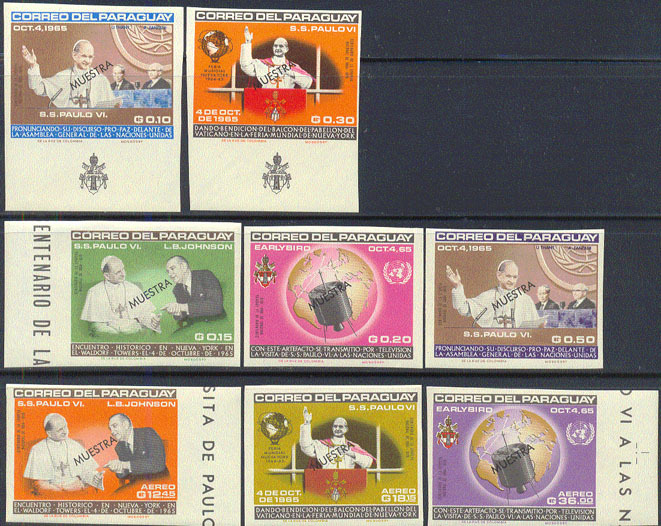 Set of 8 imperforates in unissued colors overprinted MUESTRA. Scott Nos 943-50, Yvert Nos 842-6,PA433-5. 2342 SPE PARAGUAY (1966) Drafting machine*. Map of world*. Satellites*. 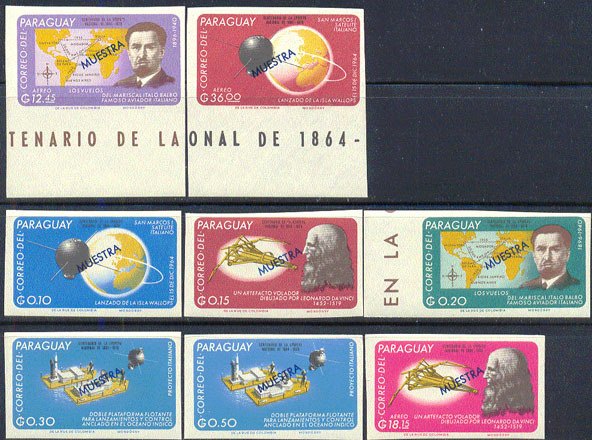 Set of 8 overprinted MUESTRA. Italian contributors to space research. Scott Nos 959-66. 2343 SPE PARAGUAY (1966) Drafting machine*. Map of world*. Satellites*. Set of 8 imperforates in unissued colors overprinted MUESTRA. Italian contributors to space research. Scott Nos 959-66. 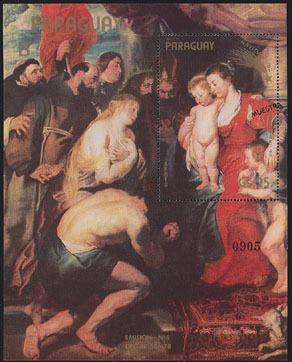 15254 SPE PARAGUAY (1966) Madonna & Child by Montegna*. S/S overprinted MUESTRA. Scott No 1003c. 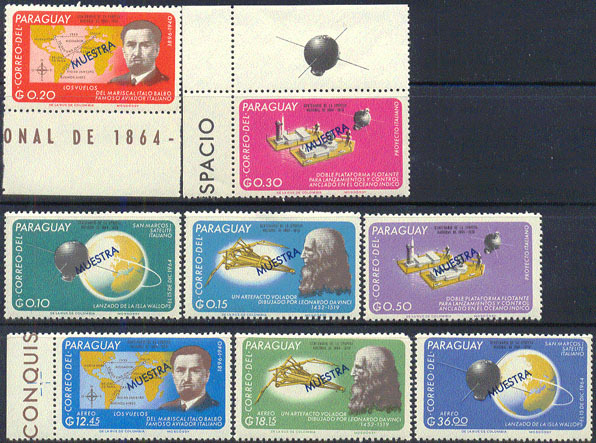 17247 SPE PARAGUAY (1966) Italian satellite San Marco I*. Imperforate S/S overprinted MUESTRA. Scott No 966a. 17249 SPE PARAGUAY (1966) Gemini spacecraft*. S/S overprinted MUESTRA. Scott No 985a. 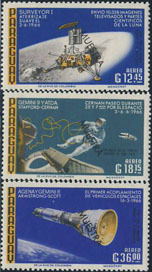 17250 SPE PARAGUAY (1966) Gemini spacecraft*. Imperforate S/S overprinted MUESTRA. Scott No 985a. 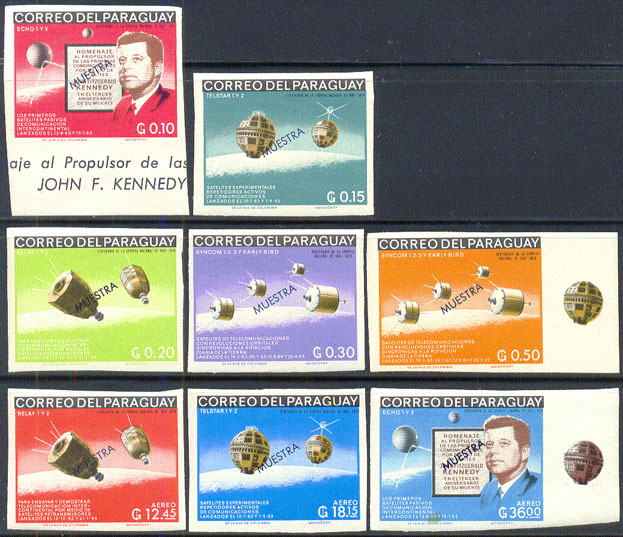 17532 SPE PARAGUAY (1966) Stamps*. German contributions to space travel*. 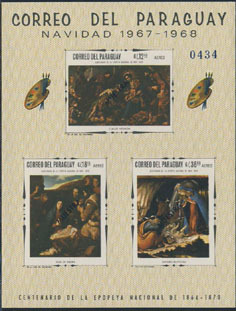 Set of 5 imperforates overprinted MUESTRA. Scott Nos 943-7, Yvert Nos 842-6. 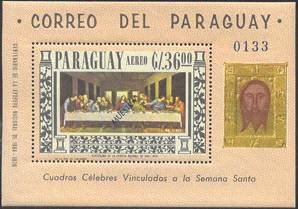 15256 SPE PARAGUAY (1967) "The Last Supper" by Da Vinci*. S/S with MUESTRA overprint. Scott No 1007a, Yvert No PA461BF. 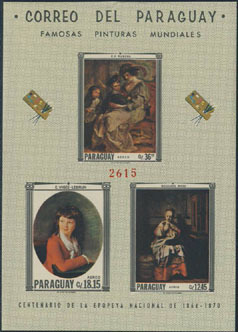 15259 SPE PARAGUAY (1967) Paintings*. Imperforate M/S of 3 overprinted MUESTRA. Scott Nos 1013-5. 15260 SPE PARAGUAY (1967) "Assumption of the Virgin" by Fernandes*. S/S with MUESTRA overprint. Scott No 1015a, Yvert No PA464BF. 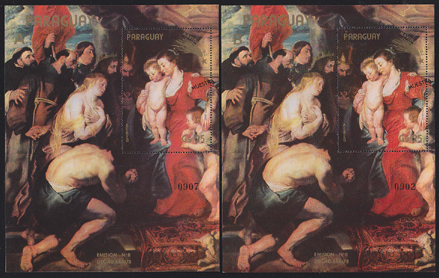 15261 SPE PARAGUAY (1967) "Assumption of the Virgin" by Fernandes*. Imperforate S/S with MUESTRA overprint. Scott No 1015a, Yvert No PA464BF. 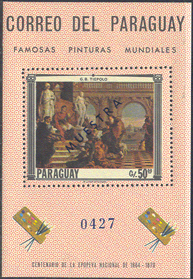 15262 SPE PARAGUAY (1967) Paintings*. Imperforate M/S of 3 overprinted MUESTRA. Scott Nos 1037-9, Yvert Nos PA473-5. 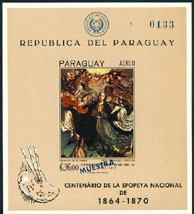 15263 SPE PARAGUAY (1967) Painting by Tiepolo*. S/S with MUESTRA overprint. Scott No 1040, Yvert No 911BF. 16877 SPE PARAGUAY (1968) Paul VI*. Madonna & Child by Tiepolo*. M/S of 2 overprinted MUESTRA. Scott No 1125. 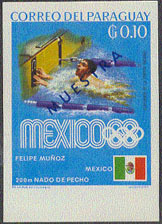 2555 SPE PARAGUAY (1969) Swimmer*. Imperforate with MUESTRA (specimen) overprint. Mexico Olympics. Scott No 1135, Yvert No 1000. 17255 SPE PARAGUAY (1969) Ernst Stuhlinger*. Imperforate S/S overprinted MUESTRA. Scott No 1221. 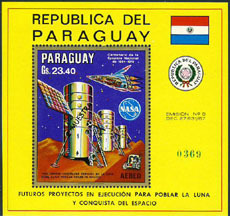 17260 SPE PARAGUAY (1970) Future moon station*. S/S overprinted MUESTRA. Scott No 1289. 15272 SPE PARAGUAY (1971) Foxhunt & steeplechase*. S/S with MUESTRA overprint. Painting by Paul & Dervaux. Scott No 1346. 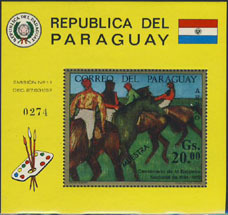 15273 SPE PARAGUAY (1971) Hunters on horseback*. S/S with MUESTRA overprint. Painting by Degas. Scott No 1347. 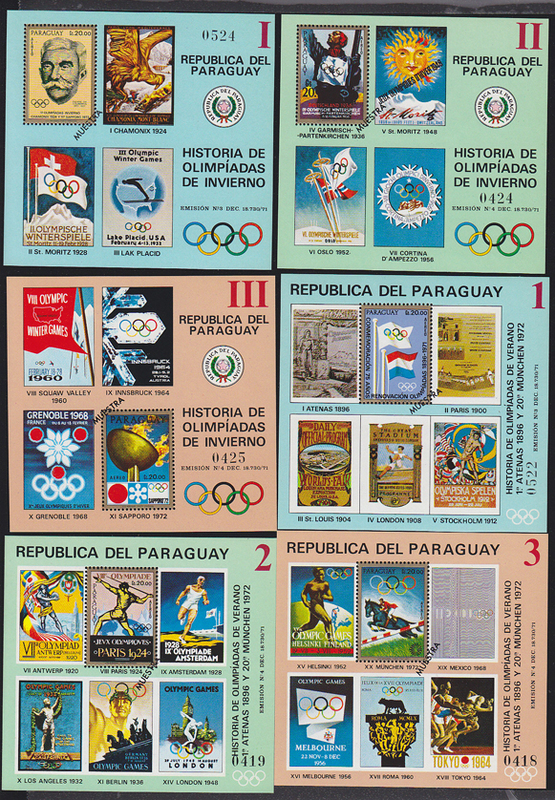 18954 SPE PARAGUAY (1972) History of the Olympics. Set of 6 S/S overprinted MUESTRA. Scott Nos C340-5. 15278 SPE PARAGUAY (1973) "In the Forest at Pierrefonds" by Albert de Dreux*. S/S with MUESTRA overprint. Scott No C355. 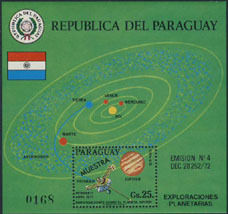 17265 SPE PARAGUAY (1973) Pioneer 10*. Jupiter*. S/S overprinted MUESTRA. Scott No 1528. 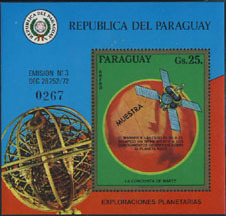 17266 SPE PARAGUAY (1973) Mariner 9*. S/S overprinted MUESTRA. Scott No C360. 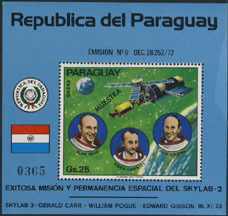 17269 SPE PARAGUAY (1974) Skylab 2 astronauts*. S/S overprinted MUESTRA. Scott No C373. 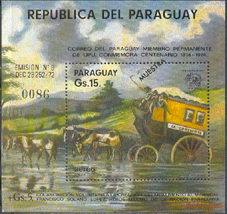 17775 SPE PARAGUAY (1974) Mail coach crossing river*. S/S overprinted MUESTRA. UPU Centenary. Scott No 1540. 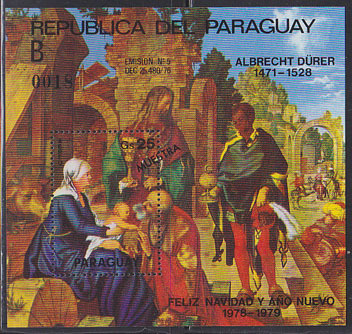 9296 SPE PARAGUAY (1978) Adoration of the Magi by Durer*. 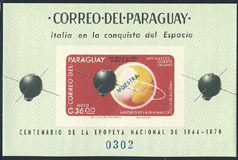 Souvenir sheet "A" overprinted MUESTRA (specimen). Scott No C468, Yvert No PA823. 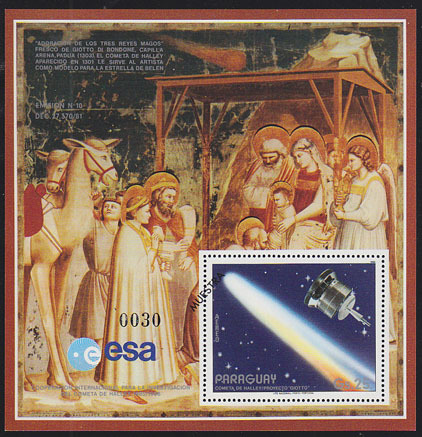 9297 SPE PARAGUAY (1978) Adoration of the Magi by Durer*. 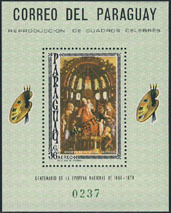 Souvenir sheet "B" overprinted MUESTRA (specimen). Scott No C468, Yvert No PA823. 785 SPE PARAGUAY (1979) Kittens*. Partial set of 3 with MUESTRA (specimen) overprint. IYC issue. Scott Nos 1908c-e, Yvert Nos 1745-7. 8342 SPE PARAGUAY (1979) Stadium*. S/S overprinted MUESTRA. 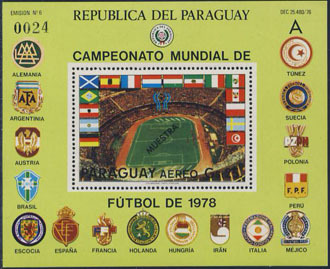 1978 World Cup issue "A". Scott No 1875. 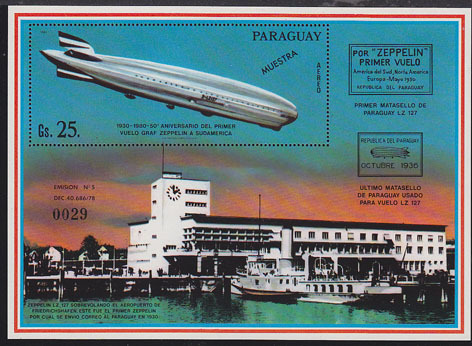 9580 SPE PARAGUAY (1981) Graf Zeppelin in South America*. Souvenir sheet overprinted MUESTRA. Scott No C501. 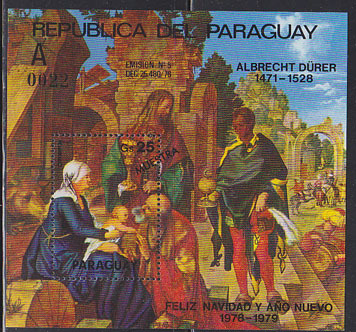 9917 SPE PARAGUAY (1981) Christmas paintings*. Set of 3 overprinted MUESTRA. Scott Nos C497-9, Yvert Nos PA885-7. 6286 SPE PARAGUAY (1982) Painting by Rubens*. Souvenir sheet "B" overprinted MUESTRA. Scott No C517. 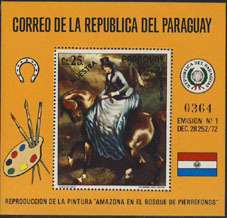 6287 SPE PARAGUAY (1982) Painting by Rubens*. Souvenir sheets "A" and "B" overprinted MUESTRA. Scott No C517. 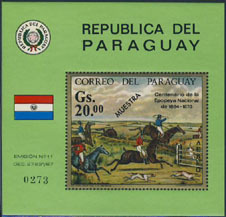 8345 SPE PARAGUAY (1982) Trophy*. Set of 2 oversized S/S overprinted MUESTRA. 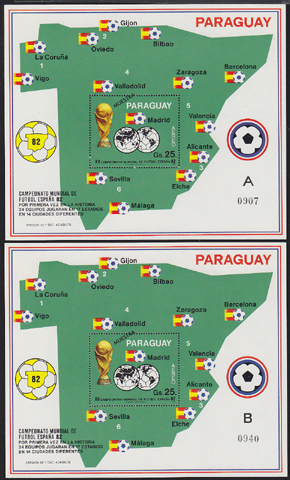 Espana 1982 World Cup issue "A". and "B" Scott No 2053a. 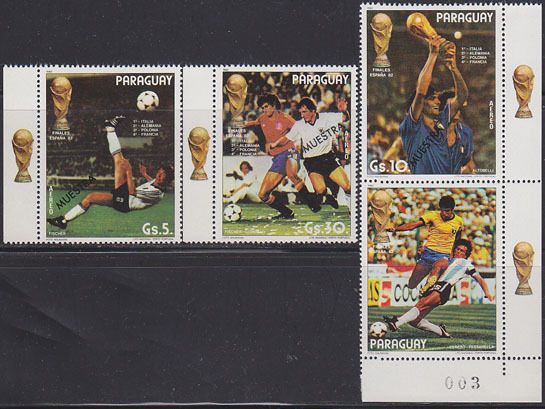 11507 SPE PARAGUAY (1982) World Cup Italy*. 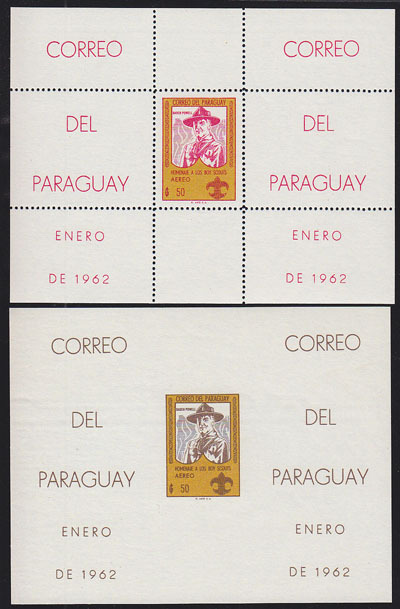 Set of 3 overprinted MUESTRA. Scott Nos C511-3, Yvert Nos PA912-4. 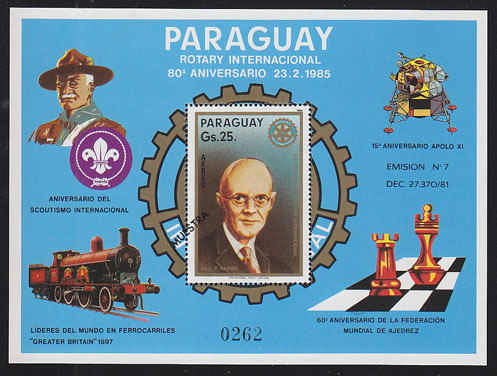 17154 SPE PARAGUAY (1982) Baden-Powell*. Scout emblem*. S/S overprinted MUESTRA. Scott No 2041. 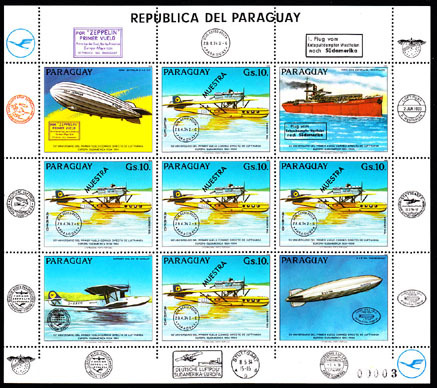 9568 SPE PARAGUAY (1984) Dorner DO J Wal seaplane. Sheetlet of 5 with labels overprinted MUESTRA. Scott No C572. 17009 SPE PARAGUAY (1985) Rotary 80th anniversary. S/S overprinted MUESTRA. Scott No C595. 15375 SPE PARAGUAY (1986) Halley's comet*. Giotto probe*. S/S overprinted MUESTRA. Scott No C644.